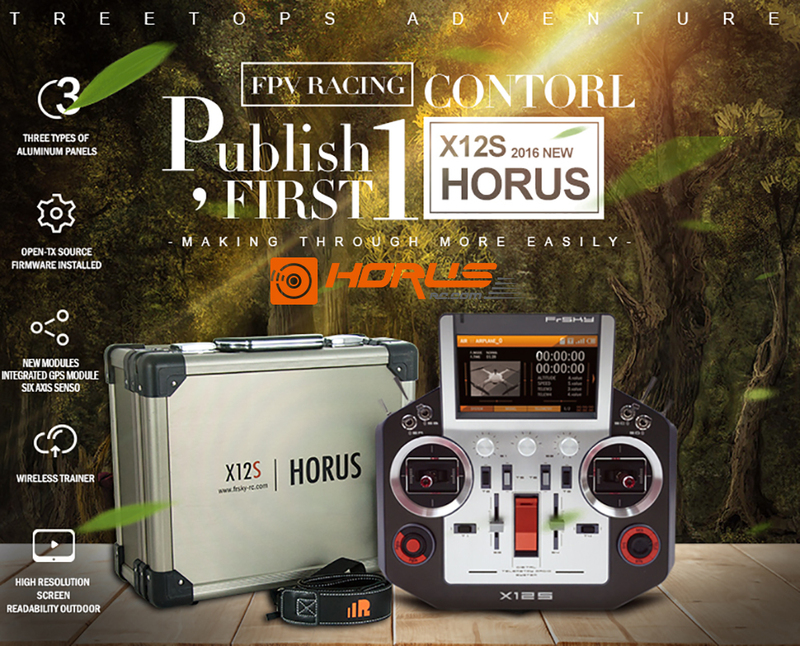 FrSky introduce the newest and most powerful radio, the horus x12s. 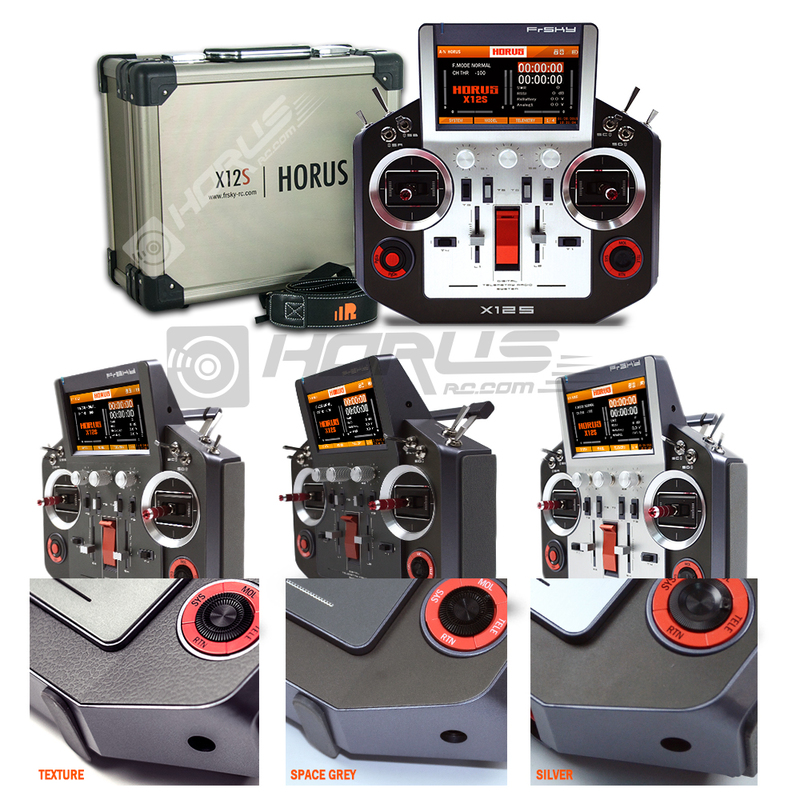 The Horus is the new flagship radio from FrSky with premium gimbals, pots, switches and components. The radio also has a built in GPS module, speaker, haptic feedback and more. The X12S features a full color LCD screen with an easy to navigate UI system. Each radio comes with a high quality hard case for transportation. The sticks are perfectly machined with a red finish to them, that goes together with the other details found at the front plate of the Tx. The stick height can be adjusted by simply screwing or unscrewing the sticks themselves. The rest of the assembly is perfectly fitted and adapted to the front panel thanks to the CNC machined parts. Smoothness is omnipresent in this transmitter: the gimbals can’t be an exception. The Horus manages to do it through hall sensors and a total of 6 bearings, to minimize frictions as much as possible. An exquisite feel, as it deserves. On both sides of the transmitter, at the top and in both sides we can find 4 switches (two in the front panel and two at the top). Six of which are 3 position and the other two are 2 position switches. The one on the right is sprung and goes back to its original state. But there’s even more: at the back, we can find sliders with a very soft and smooth feel to them. Still in the top part, in the middle and under the display we can find three rotating buttons. In both ends we can find some pots with a very soft touch. The central one contains a surprise, as it’s a 6 position encoder that will allow us to configure, for example, up to 5 different flight modes in one and only button! Under the rotating buttons we can find 4 other buttons: two for the vertical trimming and two that can be assigned to do custom functions. The trims are the black ones. Below them are the horizontal trims (also black) and surrounding the power button, two vertical sliders that might remind of a mixing console. And once again when moved all you feel is extreme smoothness. To finish off, in the lower part of the front plate the Horus has some buttons, to be operated with your thumbs, to navigate through the configuration menus of the transmitter. As it can be seen at glance, this is a transmitter with so many controls for every taste. It’s impossible to fall short in buttons! The transmitter comes with an upgraded internal IXJT RF module. This module is connected to an internal antenna, but if you don’t want to use that one, you can always plug in your own one to be used with the module. To do that you just have to change the model config so that it uses the new one instead of the internal one. Also, there’s the possibility of connecting any compatible module in the back module bay, so the compatibility with nearly every craft is guaranteed. The transmitter includes an internal 2200 mAh NiMH battery, which is a very good capacity for a stock battery. This is a plus; keep in mind that the power consumption of the Horus can be higher than a Taranis’, due to all the new functions, like the full colour screen. The transmitter incorporates a built-in charging circuit, that regulates and controls the charge of the battery, and turns itself off when the battery is fully charged. That means that if you want to charge it it’s as simple as plugging in the power transformer included in the kit to the transmitter and waiting until the charging indicator LED goes from blinking green (battery level detection and charge beginning) to solid green (charging) to no led (the same LED turns off when the battery is fully charged), and our Horus is already charged and ready to fly! At the back of the transmitter we can find various covers under which different things are hidden. Between them there’s the microSD port with the microSD in it, that has in it the operating system / firmware used by the transmitter. We can also find a USB port, which we can use to transfer files to our Horus without having to remove the microSD card. Under the cover right besides it we can find two different connectors, to use the transmitter in trainer mode. But not only that, let’s not forget that according to FrSky’s specs on the Horus, different Horus transmitters can be linked between each other wirelessly to use the trainer mode more comfortably. High resolution display (480 x 272 px): full colour screen where you can configure and monitor your saved models. New gimbals: CNC machined, equipped with 6 bearings to soften the friction, hall sensors and extensible ends. Delightful to the touch. Training System: new and revolutionary trainer system without the need to use wires. 6DOF Sensor: 6 axis sensor built-in: gyroscope and accelerometer. Customization: 3 kinds of finish to choose from between matte, textured and aluminium details on the front panel. Number of channels: 16 channels, ¡up to 32! Telemetry: communication channel dedicated to telemetry between the receiver and radio with real-time log capacity. Antenna: antenna detection and low SWR signal warning. Receiver bind: Capability to be bound with up to 64 receivers. Internal module:New Internal IXJT RF module with lower latency and higher stability. External antenna: The radio has an internal antenna for the RF module that is used by default, but it is possible to add an external one for the internal module to use. External module: You’ll have the possibility to add an external module on the back bay and select it on the model configuration. Power on button: The radio power button stays protected under the metallic support to hang the Horus. That will save you from turning it off by mistake. It even has a confirmation message for added protection. Training port: Two trainer port types to improve compatibility between radios. MP3 player: Practice your freestyle sessions ¡listening to music directly from your radio! Haptic feedback: The radio notifies you with vibrations. NiMH Battery: NiMH 2000 mAh integrated battery inside the radio with a built-in charging circuit. Encoder: New 6 position encoder. Now you can configure up to 5 flight modes in a single button. OS: The transmitter comes by default with the operative system designed by FrSky themselves: the FrSkyTX, but the transmitter is fully compatible with open source firmwares (in fact, OpenTX is currently working on a new firmware release for the Horus). This is a brilliant radio, shipped fast and in excellent condition.